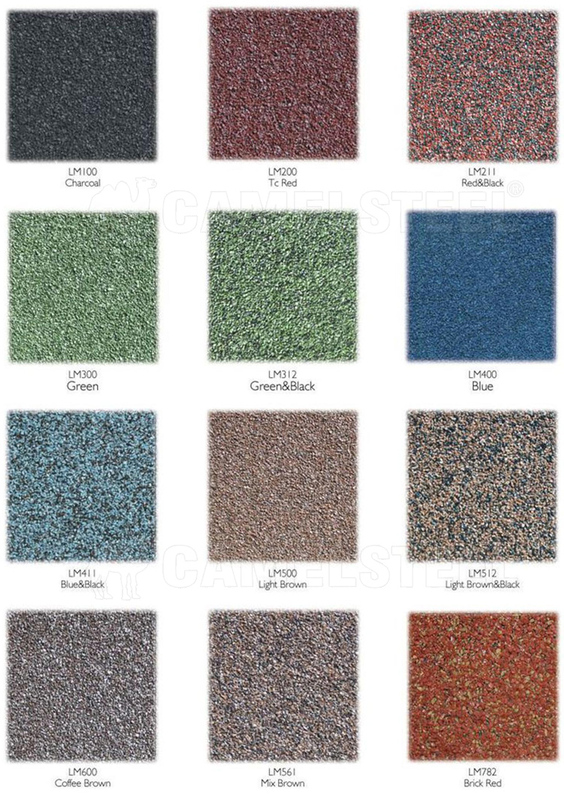 Colorful stone coated steel roofing tiles is made of high-tech, made of galvalume steel plate as base material, anti-fingerprint coating, colored sand and acrylic resin. 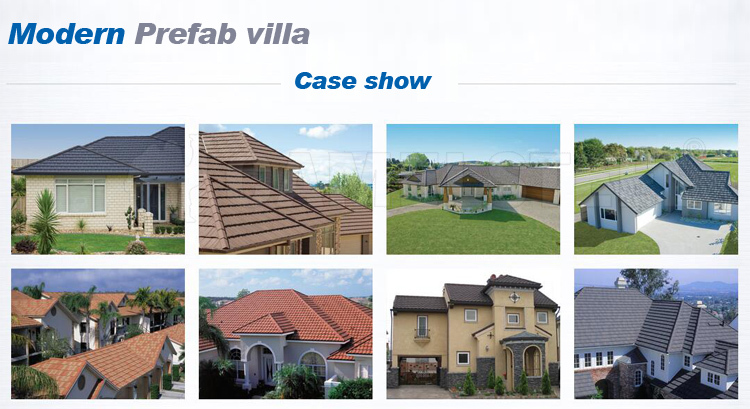 Because of its beautiful appearance, light weight, durability and environmental protection, it has become the mainstream product of international roofing materials in recent years. 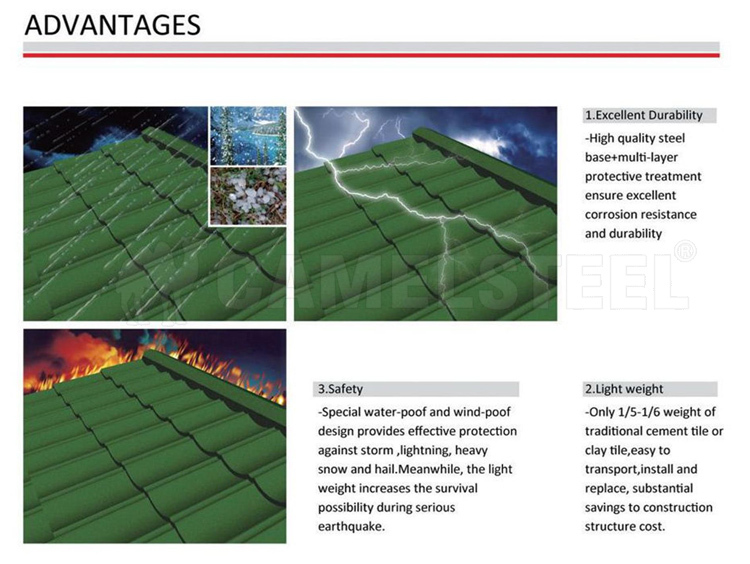 Colorful stone coated steel roofing tiles have weather resistance, moisture resistance, salt spray resistance, impact resistance, acid resistance, alkali resistance, heat resistance and non- combustibility. 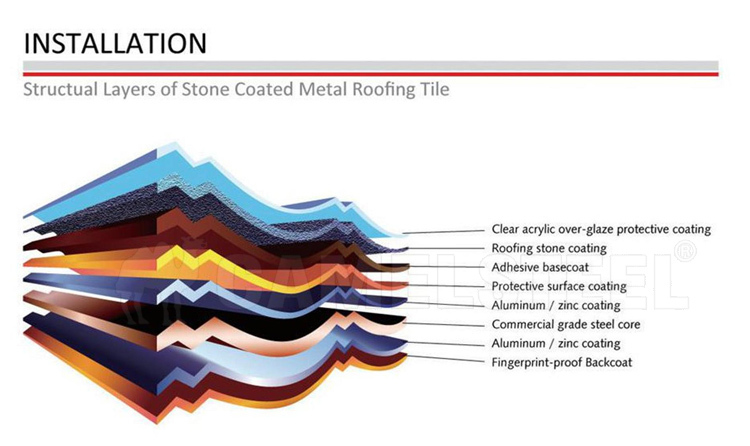 The product is based on galvalume steel sheet and is treated with multiple layers of protective film. Can withstand severe cold, hail, storm, rain and snow, and severe weather such as heat and earthquake, as well as natural disasters. It will not crack and age. It is burning in the fire and windy, and has a long service life. Asia: Thickness:0.18 / 0.19 / 0.21 / 0.24 / 0.26mm width 914/1000/1250mm,high gloss red, high gloss brown, clear varnish. Africa:Thickness0.25 / 0.26 / 0.27 / 0.28 / 0.3 / 0.38 / 0.4 / 0.45mm with 762/914/1000 /1250 mm width,red,green,blue,white. South America:Thickness 0.12 / 0.14 / 0.16 / 0.35 / 0.49mm with 914/1000 / 1220mm, red,green and blue color.2.What is the payment term? 30-50% TT in advance(based on your qty ), 70% balance against copy B/L in 7 workdays. 3.When will you arrange production? In 7 workdays when we receive your advance payment. 4. When will you send BL copy? In 3-5 workdays after shipment date. 5. When will you send original Documents? In 3-5 workdays when we get the balance. 6. From we pay the advance to we get the goods what other service you can provide? A Send photos from raw material to shipment. B Notice and remind you when will you get the goods. C Advise or Solve when you meet the problem during your production. Zibo Camel Material Co., Ltd © 2016 All rights reserved.